A historic home in Yarmouth. Foggy Yarmouth – the town gets an amazing 191 days of fog a year – has long been the home of sea captains. Today it’s best known as the port of the Cat Ferry service between Nova Scotia and New England. Many tourists, eager to reach better known destinations like the fishing village of Lunenburg on the south shore or the Annapolis Valley to the north, breeze right through. While the town doesn’t have the charm of some smaller fishing villages, there’s enough to amuse you for a few hours. 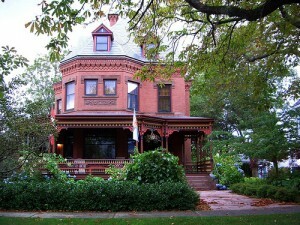 Aside from the stately Victorian homes, there’s a historic downtown with many boutiques. There are several local museums, gardens to stroll through and an outpost of the main Art Gallery of Nova Scotia. Just 10km outside Yarmouth is the uniquely shaped Cape Forchu lighthouse, set on the tip of a peninsula. It’s one of the area’s most photographed sights. Yarmouth is also a convenient stop for the night, with plenty of accommodation options from camping to B&Bs and full-service hotels. The tourist information centre (May to October, 8am to 7pm) is on Main Street, just up the road from the ferry terminal. Pick up a brochure guide to a walking tour of the downtown here. Directions: Yarmouth is about a 4 hour drive along Highway 103 from Halifax but allow double that if you want to meander along the smaller roads of the southern coastline.